the algarve way is a trail right up in the hills. It can be walked, cycled and some companies even do it on horseback http://www.riding-vacations.info/. Despite being a good trail, it’s not easy. It passes right near the top of the highest mountains in the region. The logistics of this trip are quite complicated (these will be none of your concern though!) and it involves a few short transfers to the various hotels after you’ve ridden a stage. We’ve found a selection of fantastic little hotels along the way, mostly 3* or rural guest houses and all very comfortable and well located. 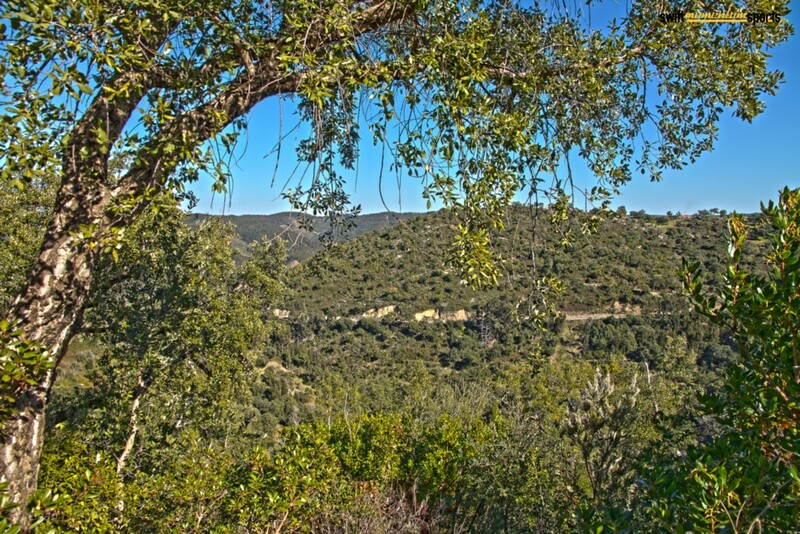 some of the landscape along the algarve way. The whole route is 286km. This is a big cycle by any standard, especially in the five days we propose. You’ll be riding for up to four hours a day and it’s nearly all on trails. This is a fantastic trip for the nature lover as you’ll certainly come across a lot of amazing wildlife -check out my algarve blog to read about just a few of the things you might see along the way. The price for the holiday is €1400.00 based on two sharing. We don’t run this holiday in November-March and August, singles pay an extra €200,00. This includes a bike, the transfers, support should you need it, breakfast, picnic lunch and a route book. We don’t provide a guide for this route, but are more than happy to advise you along the way should you wish. We provide a phone, for communication with our team and optional tracking, but it’s worth noting that the phone wont have coverage for a lot of this route. Dinner is not included, as at many points on the journey there will be a choice of good restaurants. this is an easy route which is mostly flat and involves no technically challenging riding. 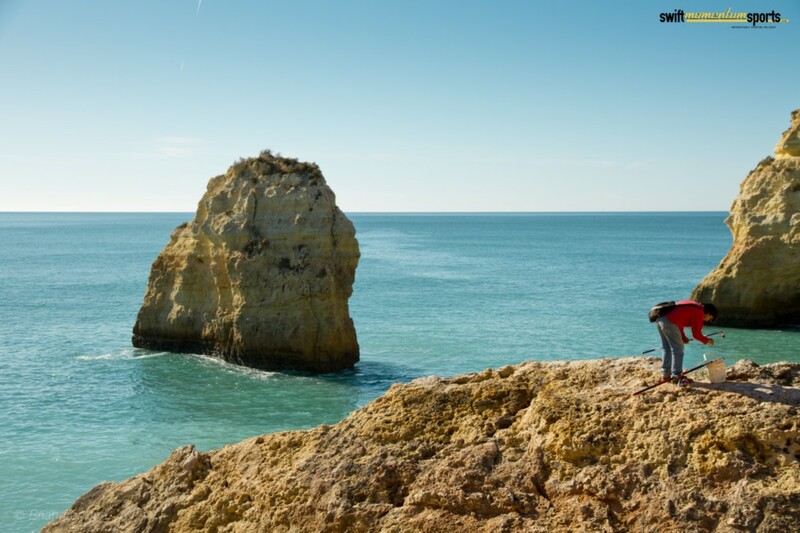 The Algarve has a wonderful coastal mountain bike route that takes you all the way from the Spanish frontier in the east, to the tip of Europe at Cape St. Vincent. The first half of the trip is through a national park, taking past a lagoon and a long line of barrier islands. Along the route are many picturesque beaches and quaint towns with a very interesting history, your route book will have some details on the attractions. 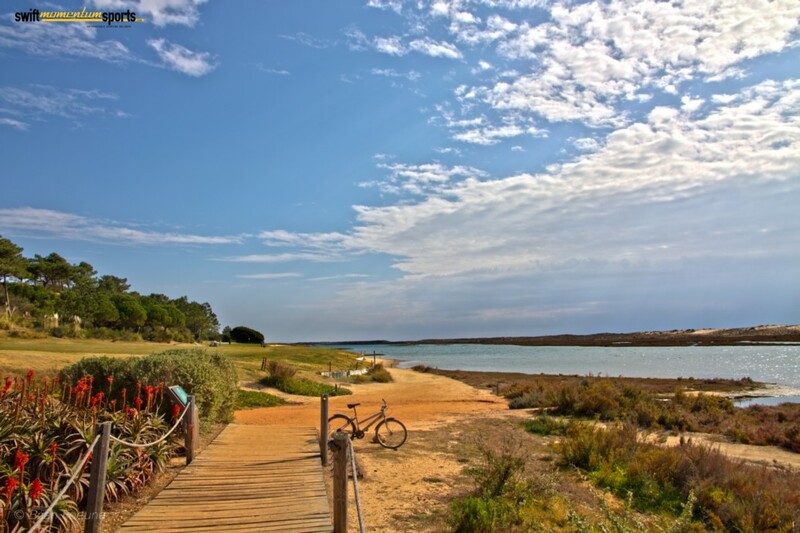 the ria formosa lagoon, makes up a huge nature reserve that spans over a third of the algarve coast. The second half of this trip skirts along through the countryside and many coastal towns dotted along the coast with the final 40 km being in interesting and largely unspoilt countryside. Very few sections of this trip are on the main roads. While there are markings along the way, I provide you with a map and a gps (optional; €30) to make sure you don’t stray of course (not unintentionally anyway!). Someone will never be more than 1 h away should you need help and you’ll have the peace of mind of knowing that you’re fully insured in case of an accident. We can track you too (it’s a free optional extra) through a mobile phone we provide for you anyway to stay in touch with our team. the yellowish limestone cliffs on the south coast are where we got the colours for the SMS logo. There will be no heavy panniers here! All luggage is transported for you from hotel to hotel. Hotels may vary from trip to trip (we can’t assure there will always be openings in a particular hotel), but all of them are three and four star and have been (nearly all) tested by me to make sure that they provide a good quality of service. We don’t provide evening meals on this holiday, so you have the opportunity to explore the many fantastic restaurants in the region. I provide a list of impartial recommendations for you though -all tried and tested- in each town that you’ll visit. Our trip can be guided or self guided and involves stages of no more that 40 km a day with the whole week not totalling more than 180 km, giving an average stage length for the five days of 35 km. Of course the fact we use only good quality bikes makes this trip seem easier! A guide is optional and costs €400,00 per week, so quite affordable for large groups, however the information we provide in the route book is good. We run this holiday April though till the end of October excluding August (too busy, too hot) and prices are €595,00 April, May and October, €660,00 in June and €785,00 in July and September based on two sharing. Singles are required to pay a €200,00 surcharge. While we can’t book flights for you, you can expect to make to purchase a flight very cheaply as the algarve is very well served by budget airlines. This holiday is run over 7 days at your convenience, so you choose your dates. We need at least 4 weeks notice before the holiday is due to book hotels and re-check the route.